The Kolab Sor Phom Penh Hotel is a haven of rest and relaxation located in the Beung Keng Kang area, 1.3 km from the Capital Bus Station, and conveniently 7.8 km from Phnom Penh International Airport. 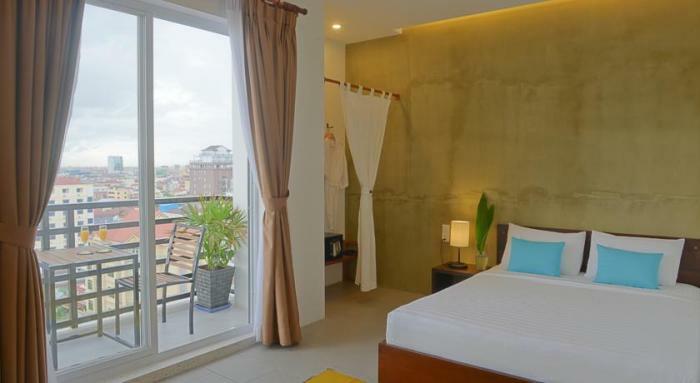 The Kolab Sor Phnom Penh Hotel has 52 bright, spacious rooms with beautiful views of the city, free wireless internet access, air conditioning, an in-room safe, and a desk. Guests can enjoy a variety of services to enhance their stay including a restaurant located on the mezzanine floor which serves a selective of Asian and Western cuisines. Nearby attractions include the Tuol Sleng Genocide Museum, the Independence Monument, Lucky Market, the City Mall Shopping Center, and Preah Sihanouk Street. Kolab Sor Phnom Penh Hotel in Phnom Phen! La Maison D'Ambre Hotel is situated amongst the many religious interests, sightseeing venues, and culture-rich attractions of Phnom Penh city which provides visitors an amazing home base for your daily adventures around this lively city, located 20 km from the city center and 11.9 km from Phnom Penh International Airport. La Maison D'Ambre Hotel has 10 individually-designed rooms and suites, all tastefully, and comfortably furnished. Nearby attractions include Psah Chas (the Old Market), Deum Kor Market, and Preah Norodom. 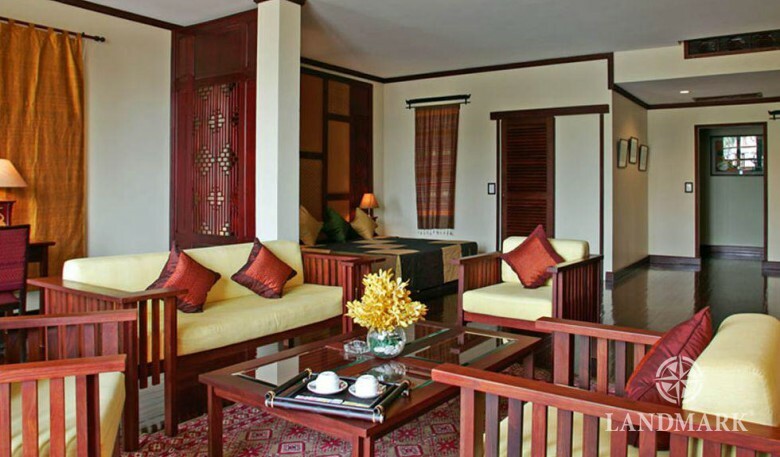 La Maison D'Ambre Hotel is your one-stop destination for quality hotel accommodations in Phnom Penh. La Maison d'Ambre Hotel in Phnom Phen! 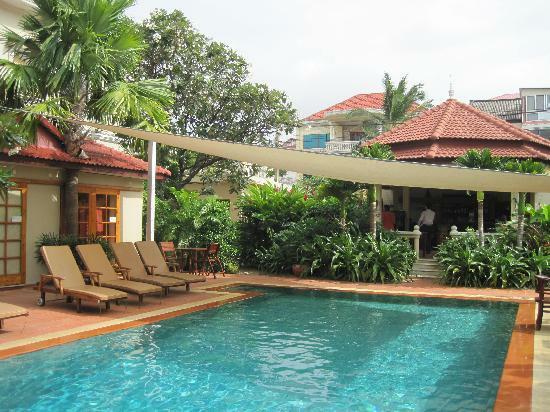 The Villa Borann is located in the sought-after Royal Palace area, 8.8 km from Phnom Penh International Airport and steps away from numerous attractions. Step into one of the 10 bright, inviting rooms and escape the stresses of the day with air conditioning, a TV, shower, and wireless internet access. Guests have access to a range of amenities at the Villa Borann including 24-hr room service, an outdoor pool, a business center, airport transfer, a smoking area, and tours. Nearby attractions include the Independence Monument, the Naga World Hotel & Casino, the North Korean Embassy, Wat Botum, and the Royal Palace. 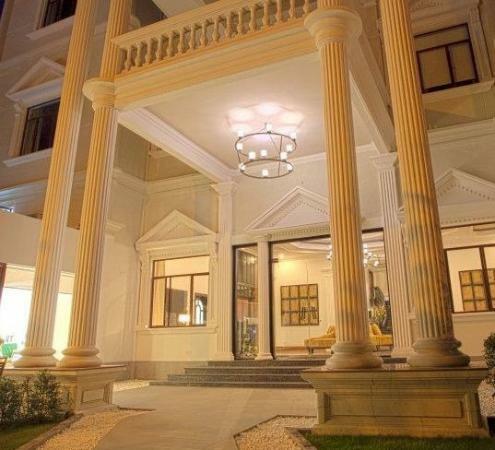 Villa Borann in Phnom Phen! Rambutan Resort, a gay-friendly resort which welcomes everyone, is located just 500 m away from the city center, and a 20 minute drive to reach the airport. Rambutan Resort is home to 19 tastefully furnished bedrooms which include air conditioning, rain shower, room safe, coffee/tea maker, wireless internet access, and views of either the garden or the pool. All Deluxe rooms have private outdoor bathtubs for an extra taste of luxury. Being within walking distance of the city center means many attractions are close by, including Toul Sleng, the Russian market, a number of embassies, and the many shops and restaurants in the area. Rambutan Resort in Phnom Phen! The Sangkum Hotel is ideally situated in Wat Phnom, one of the city's most popular locales, 1 km from the city center and 8.5 km from the Phnom Penh International Airport. This hotel features 12 beautifully appointed rooms which offer a TV, in-house movies, free wireless and LAN internet access, a fan, and a seating area. 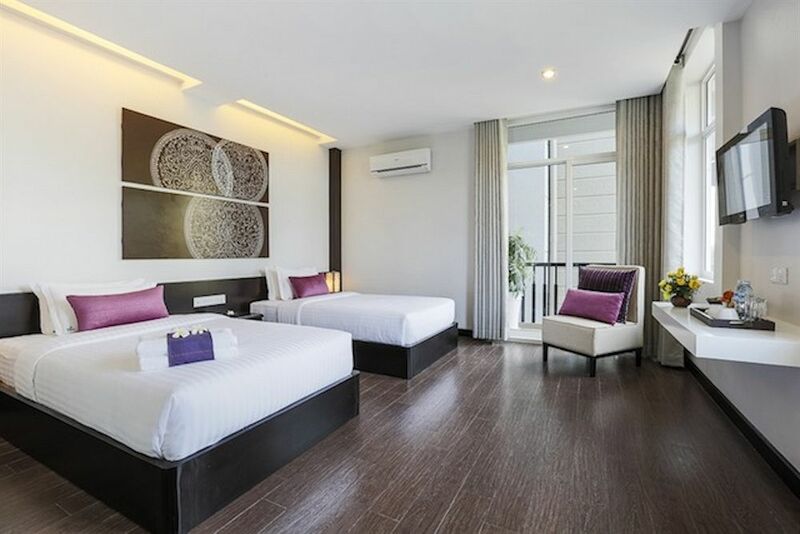 The amenities provided by The Sangkum Hotel ensure a pleasant stay for guests including a restaurant, poolside bar, kids' pool, garden, outdoor pool, room service, airport transfer, smoking area, safety deposit boxes, and laundry service. Being within walking distance of the city center means many attractions are close by, including the United Kingdom Embassy, Wat Srah Chak, and Calmette Hospital. The Sangkum Hotel in Phnom Phen! The Plantation Urban Resort and Spa is a 4-star hotel ideally located in the Royal Palace area, 12 km from the Phnom Penh International Airport, with excellent service and superior facilities which make for an unforgettable stay. The hotel features 70 bright, beautifully appointed guestrooms. The Red Pool Bar is open to everyone and ideal for cocktail gatherings during a lazy sun-soaked afternoon or star-lit evening. Recreational facilities at this hotel include a fitness center, spa, garden, and 2 outdoor pools. With the city's main attractions such as the Silver Pagoda, National Museum, and the Royal Palace within close reach, visitors to the hotel will just love its location. The Plantation Urban Resort in Phnom Phen! Directly in the city center, La Rose Boutique Hotel and Spa is located in the Bouding area of Phnom Penh, 8.8 km from Phnom Penh International Airport, this hotel provides the perfect home base for your daily adventures in this lively city. The ambiance of La Rose is reflected in every one of their 10 guestrooms, decorated with understated elegance. Amenities of the hotel include 24-hr room service, restaurant, bar, coffee shop, bicycle rental, tours, babysitting, shuttle service, business center, and laundry service. Guests of this hotel enjoy its close proximity to many attractions within the city center including the Independence Monument, various embassies, Neak Banh Teuk Park, Wat Thunn, and the Royal Palace. 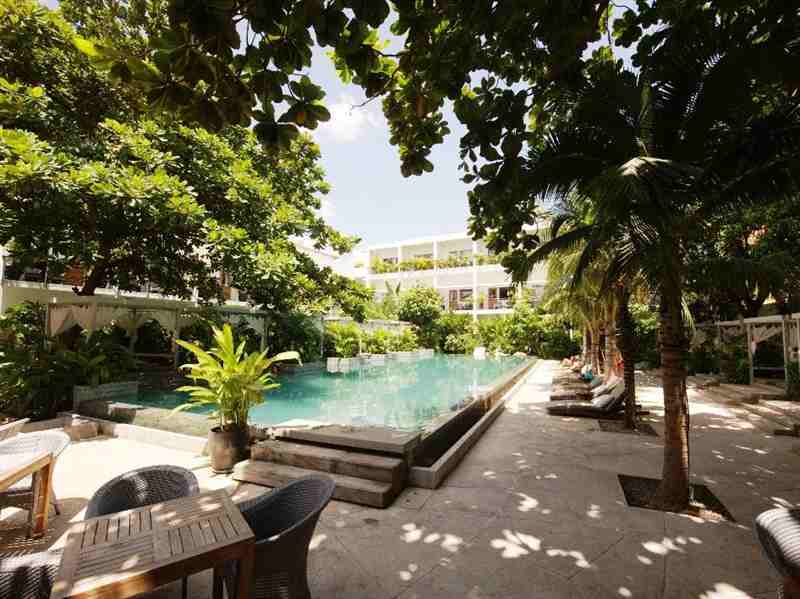 La Rose Boutique Hotel Spa in Phnom Phen! Nestled within the heart of Phnom Penh, in the Royal Palace area, this exclusive 4-star boutique hotel sits in a peaceful residential area, 5 km from the Phnom Penh International Airport. 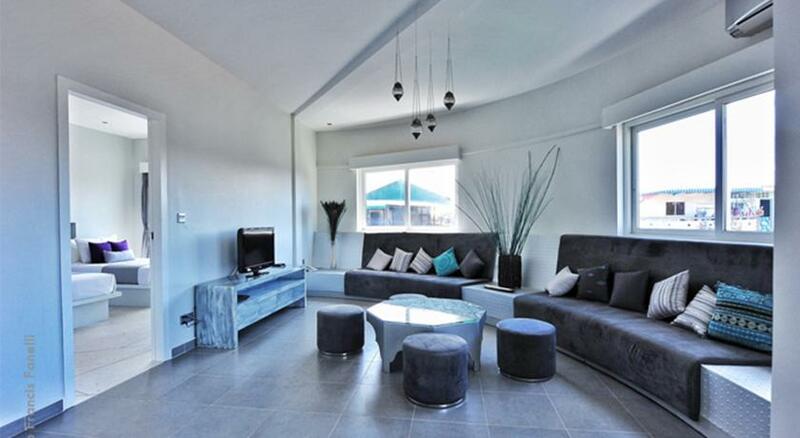 The Villa Paradiso features 12 uniquely-designed, beautiful rooms that welcome guests at first sight featuring modern amenities, free wireless and LAN internet access, and a TV. They also pamper guests by offering luxurious recreational facilities like a spa, outdoor pool, garden, hot tub, sauna, detox, and massages for rejuvenation. Nearby attractions include the Royal Palace, and a myriad of restaurants and bars. A flawless property, The Villa Paradiso is famous for its cordiality. 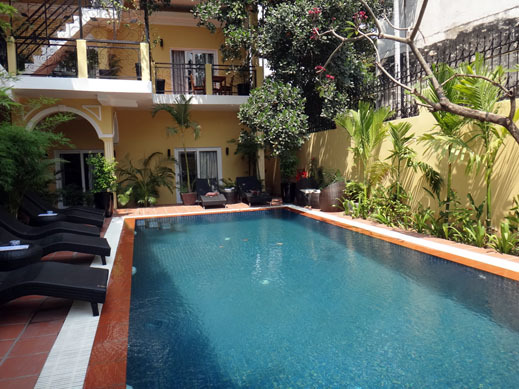 The Villa Paradiso in Phnom Phen! White Mansion Boutique Hotel is a luxurious 4-star hotel that will sweep you off your feet the moment you enter the lavishly decorated lobby. Located in the Royal Palace area, 1 km from the city center, and a 30 minute drive from the airport, this hotel is sure to impress. White Mansion boasts 30 sophisticated and comfortable guestrooms. Nearby attractions include the Royal Palace, the National Museum, the Sisowath Quay, the What Phnom, the Independence Monument, the Central Market (Psar Thmei), the Russian Market (Psar Toul Tom Poung), and Street 240 (the famous Shopping street in the city). With its commitment to service and focus on hospitality, you'll enjoy your stay at White Mansion Boutique Hotel. 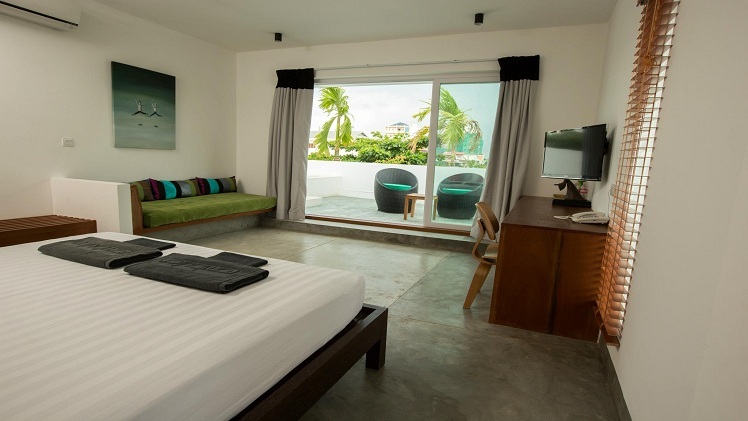 White Mansion Boutique Hotel in Phnom Phen! Amanjaya Pancam Hotel is located along the famous Sisowath Quay riverfront, designed with traditional Cambodian textiles and locals touches, conveniently located 1 km from the city center and 12 km from Phnom Penh International Airport. The Amanjaya Pancam has 21 spacious rooms with equally spacious bathrooms, free wireless internet access, and decor that echoes the traditional Cambodian decor of the public hotel areas. Nearby attractions have both historical and entertainment opportunities including the National Museum, the Royal Palace, Wat Ounalom, the Mekong and Tonle Sap River, and the nightlife of the surrounding area. Amanjaya Pancam Hotel in Phnom Phen!